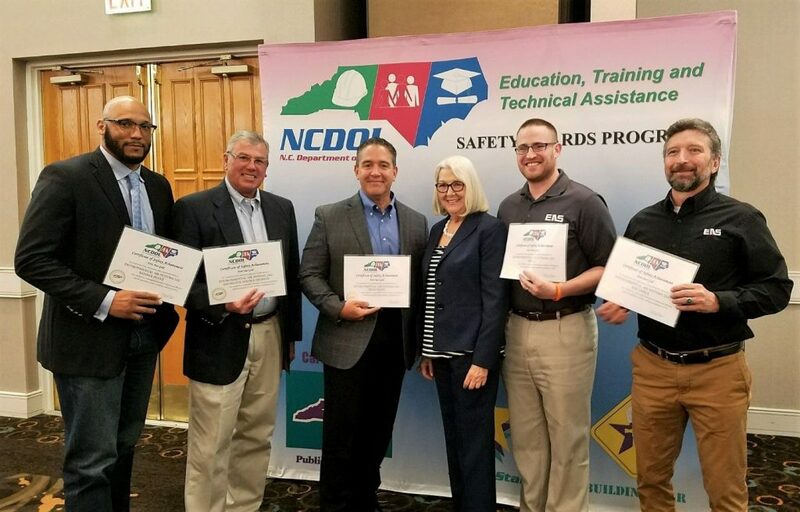 Each year the North Carolina Department of Labor recognizes companies with outstanding safety and health that resulted in a substantial reduction of injuries and illnesses and the promotion of safer working conditions. All seven Environmental Air Systems OSHA reporting locations were recently recognized for their outstanding 2017 safety accomplishments at a recent reception. The award reception was attended by Adam Kelly, EAS Safety Director; Mike Fitzpatrick, EAS Manufacturing HR & Safety Manager; Romaine Camera, VP & GM Envirotrol; Mike Manring, EAS Field Operations Manager and Joe Wesley, Regional CSUSA Safety Director. The NC Labor Commissioner, Cherie Berry handed out the awards. Have maintained an incidence rate at least 50 percent below the average for its particular industry group. There are two award levels distributed – gold and silver. TheGold Awardis based on the days away, restricted, transferred (DART) rate, which includes cases of days away from work, restricted activity or job transfer. See lines H and I of the OSHA form 300A to determine the DART rate. TheSilver Awardis based only on cases with days away from work. They are recorded when the worker misses at least one full day of work, not including the day of the injury. 5 Gold Awards: EAS field construction, Banner Office & Sheet Metal shop, Envirotrol, Triad Manufacturing plant and RTP Raleigh office were recipients in this category. 2 Silver Awards: The High Point and Jamac Manufacturing plants were recipients in this category. Also the Environmental Air Systems total combined company was also recognized for exceeding One Million Man Hours without a Lost Time recordable injury. EAS has gone on the reach One Million Eight Hundred Fifty Thousand Man Hours without a Lost Time recordable injury. Everyone at Environmental Air Systems has each others back and has The Courage to Care.